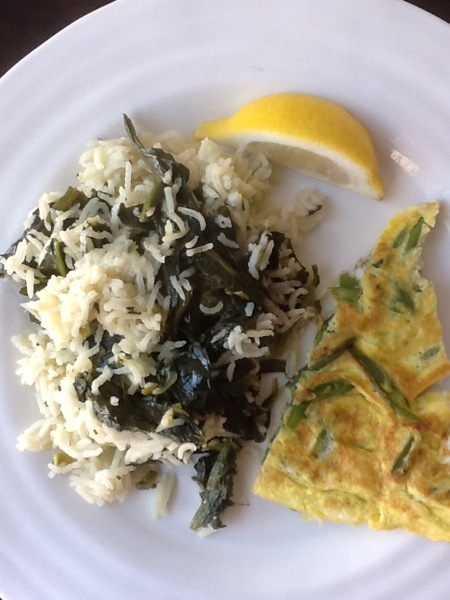 Tessa Kiros’ Spinach Rice with A Side of Pancake | One Picture, A Million Words. Thus, I presented a green bean pancake a.k.a. vegetable omelette for dinner. The spinach rice is a recipe taken from a beautiful cookbook called Falling Cloudberries written by Tessa Kiros. It is very simple to make and easy to eat. A squirt of lemon juice over the rice brightens the flavour immeasurably. I like to cut the lemon into wedges and serve it on the side because my daughter gets a kick out of squeezing her own lemon wedge over her bowl of rice. < Previous To the Park We Go! She knows an omelette is an egg dish!